S.A.F.E. 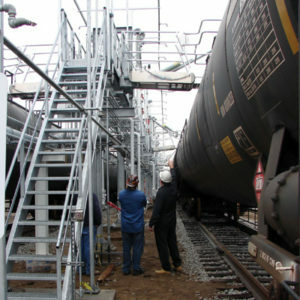 Structure Designs supplies the rail industry with custom work platforms and equipment that provide safe access to difficult or hazardous work environments. Our goal is to get you back out on the rails as safely as possible and in less time, that’s why our customized solutions are centered around the safety and efficiency of your rail maintenance crews. Work with us to design custom gantry cranes, work platforms, and/or specialty tooling specific to your application. Listed below are a few examples of the types of solutions that we can provide for your rail maintenance needs. Need something not listed here? Contact us for a complete needs assessment and recommendation based on your unique requirements.